Despite some educational reform taking place in Burma, ethnic education workers claim that equal opportunity for them will only be possible when the country’s education system is decentralized. Padoh Saw Lah Say, Head of the Karen Education Department, the educational wing of the Karen National Union (KNU) made the point during the World’s Teachers Day on October 5th in Thay Baw Boe village, Kawkreik Township in Karen State. “To have equality, changes to [provisions] the Constitution are needed. The decentralization policy must be put in place. If the centralization system is to continue to be applied, the equality [in education] for ethnic nationalities will never happen,” Padoh Saw Lah Say told Karen News. Padoh Saw Lah Say pointed out that even though the government said that the education system is changed, it is still centralized and there is still no equal education opportunities for ethnic groups. Padoh Saw Lah Say said that the educational reform taking place with the current government is only changes to the terms in the old policy. P’doh Saw Lah Say said that unless the changes are made at the root of the policy, there will not be improvements, not only in the education of ethnic people, but also to education of the whole country in general. Saw Eh Khue, a head teacher from Thay Baw Boe High School said that the schools ran by KED in the mixed controlled areas of both KNU and government, are still having many problems such as the funding and discrimination. 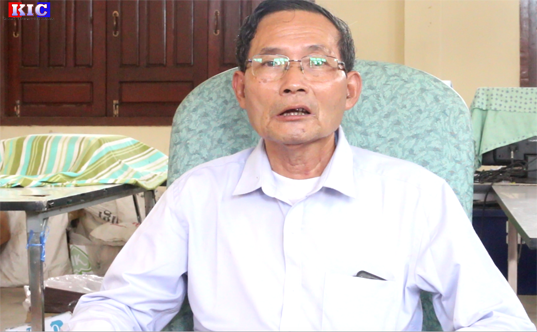 Teacher Saw Eh Khue said even as a head teacher he is often questioned about his educational background. Karen Education Department officials said that KED run Karen schools under mixed control areas have been turned into government schools because of the difference in funding support. U Saw Min Khin, head of Education Department in Myawaddy, that is part of the government’s Education Ministry said that Karen teachers need to be supported. According to Karen education workers, during the five years of the ceasefire agreement between the KNU and the government, despite several meetings were held between the KNU and the government’s Education Ministry there is still no progress on the equality of ethnic education. According to the 2015-2016 Academic year record prepared by the Karen Teacher Working Group, there are 1,529 schools and 7,607 teachers operating under KED in the seven districts of KNU – Thaton [Doo Tha Htoo], Taungoo [Taw OO], Nyaunglebin [Kler Lwee Htu], Blet/Dawei [Megui/Tavoy], Papun [Mutraw], Doo Pla Ya and Pa-an.